RUSH: We’ve also got the continuation of palace intrigue in the White House. This is getting amazing, the various factions, who they are, what they are leaking. Just to give you a little hint, there is serious leaking that Trump is going to deploy anywhere from 50,000 to 150,000 troops to Syria, that this is going to happen at the behest of David Petraeus, who lost his security clearance under Obama but is heavily tight and influential with H. R. McMaster. And that Petraeus feels the job in Iraq was not done. That Bush ended things prematurely. That Obama made a mess of everything. And these military guys think the Middle East and ISIS and Syria, all of that, need to be cleaned up, cleaned out once and for all. And Steve Bannon doesn’t want any of that. (laughing) There are these factions in the White House arguing over these policies, and some people are not being permitted into the policy discussions. But that’s what the palace intrigue is all about. RUSH: We go to Chris here in Raleigh, North Carolina. Chris, you’re first. That means you gotta set the tone for the rest of the day when it comes to callers. That means you gotta be good and interesting and compelling. Can you do it? RUSH: Testing, hello? Are you there? CALLER: Oh, can you hear me? RUSH: I do now, yeah. CALLER: Okay. Rush, thank you for taking my phone call. I appreciate it. 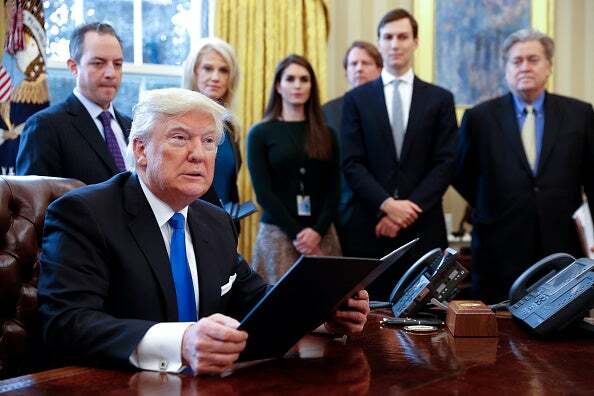 My question to you is, do you think Steve Bannon’s time is limited in the White House with the current issues that Trump is facing from mainstream Republicans? 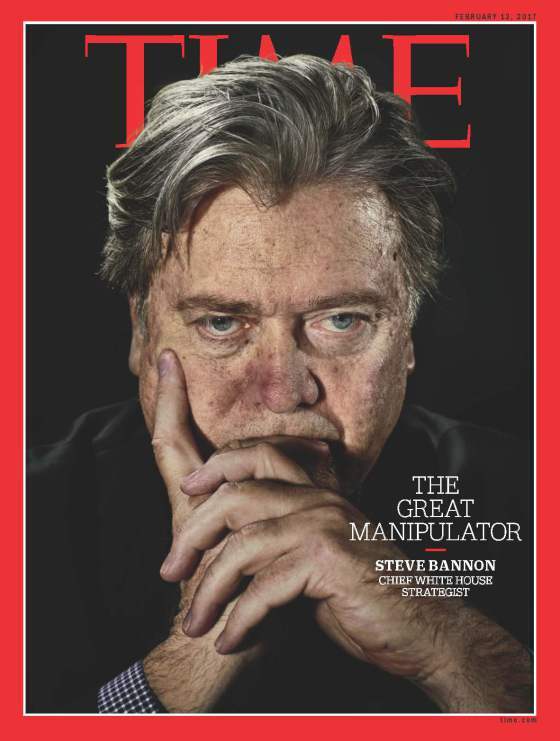 I mean, I understand Steve Bannon got a core group of individuals to vote for Trump and set his base for his ideals, but do you think that time is coming to an end? Do you think he’ll stick around for the full four years? RUSH: Well, now, that’s a different question. There’s a bunch of questions you could ask. Do I think Bannon will be will four years? No. But only because very few White House aides last that long. The press secretary is not gonna be there four years. You know, the Clinton and Obama press secretaries were not there four years. You start getting into year four and you get into the reelection, that’s when people start bailing. Now, I’m just giving you that statistically. I’m not answering whether or not Bannon will make four years based on what’s happening now. RUSH: I’m basing it purely on the statistical record of the movement in and out of an administration by aides. I think what you really mean, you’re asking is Trump gonna fire him or is he gonna quit, one of the two things, right, based on what’s happening now? Now, one of my beliefs, one of my theorems that I have evolved over the years is that when it comes to Democrats and the media they will always tell us who they fear. And all we have to do to learn that is look at who they’re trying to damage and/or destroy. And it is clear that they are scared to death of Steve Bannon. Now you have to ask, why? What is it about Bannon that scares them? Well, the answers, many of them, are obvious. He has a disdain for the establishment. He has a disdain for everything the establishment holds dear, such as globalism, a singular powerful world government in which the United States is an eager participant. He opposes — it’s not just the military-industrial complex that Eisenhower warned about. The governing complex today is military, industrial, financial, and media. It’s not just military and government. It’s now investment banks, big time Wall Street money such as Goldman Sachs. Do you know that you’d have to go back a long way to find a presidential administration that has not had somebody from Goldman Sachs in it? Either a chairman or a president or a trader or somewhere? You’d have to go back a long time to find that. The media, they are, of course, not at the table per se, but they may as well be. The military, the generals and so forth. Bannon opposes all of this. Bannon thinks that’s why the United States is mired in the muck that it’s in. He opposes all of it. And Trump gave the impression that he opposes all of it during the campaign. And Trump names Bannon as the CEO of the campaign. So that puts Bannon’s fingerprints on the campaign. And then, after he wins the president, Trump makes him the chief strategist. Bannon is an outsider. He has worked at Goldman Sachs himself, but it’s not something that he trades on the way he would if he were liberal and trying to get on with Democrat administrations. He’s done many other varied things. But Bannon represents everything the left and the establishment hates. And because he has Trump’s ear and because they think Trump is influenced by the last person he talks to — this is something very important for everybody to understand. People we’re talking about here — the media, the Washington establishment — they are not impressed with Donald Trump’s intellect. They believe that Trump is easily manipulated. They believe that Trump will believe and be influenced by the last person he talks to on an issue. So if Trump is worried about what to do about Chinese currency manipulation, if the last person he talks to is Jared Kushner, and Jared Kushner says something that is impressive to Trump, then that’s what Trump will believe. That’s what they believe. Part of it is jealously. I mean, they all wish they were that close to a president. To them Bannon’s a pig, he’s a slothful pig. The guy ran the Breitbart website. Look at him. How could a guy like that — what’s his pedigree? He didn’t come from the chain of command you have to come from to get that close to power. It’s personal, it’s professional. And it’s obvious that they are desperately worried about the guy because they think it is crucially important to get him out of Trump’s sphere of influence. So the question now becomes, is what we’re hearing about Bannon being on thin ice, is it true? You ought to see, there’s a Politico story. It’s gone to the completely fully insane now. There is a long story in the Politico today — might be their magazine; I forget which. And the top half of the Web page when you log on is a close-up of Bannon, who does not look good, and the headline is — I’m paraphrasing, but it’s close to this — if Trump fires Bannon, will Bannon seek revenge? It is a story of all the things Bannon has done to get even with people who he has fired, who he has mistreated, or what have you. And it indicates, it quotes people that have been fired by Bannon or quit Bannon and they detail what he does to get even with them. It’s incredible. So they make it look like Trump might be afraid to fire Bannon because look at what this guy’s capable of doing. And I’ll tell you what the purpose of this story is. I can tell you right now what the purpose of this story is. This headline: “If Steve Bannon Gets Fired, Will He Seek Revenge?” This story is aimed right at Donald Trump. What they want Trump’s reaction to be, “You kidding? You mean you think I’m afraid to fire Bannon because I’m afraid of what Bannon might do? Oh, yeah? Well, take a look at this.” They’re trying to engineer Bannon being fired. To answer your question, I don’t think Bannon will be fired. I don’t think it at all. Now, if a decision is made by Trump that he doesn’t want Bannon there, he will do things that make Bannon quit, but he will not fire him. I mean, you don’t need that. I mean, here you hail the guy after the campaign as your CEO of the campaign, then you make him the primo number one strategist in less than a hundred days, blow the guy out. In the midst of all these stories, you let the media have a scalp? Just don’t see it happening. I don’t know, folks, if Donald Trump wishes that Bannon wasn’t around, then might engage in behavior, say things to the media that would so irritate Steve Bannon so that he resigns. But then Bannon’s smart enough to know all this too. This takes us to the other side of the administration and who’s orchestrating all this stuff against Bannon, and we know who that is, or we think we do. And all of this palace intrigue is all focused — you notice nobody’s leaking anything about Kellyanne Conway? You notice nobody’s leaking anything about Gary Cohn? You notice nobody’s leaking anything about Dina Powell? You notice nobody’s leaking anything about Ivanka? You notice that nobody’s leaking anything about Jared Kushner? Well, I take that back. There was a story yesterday in the Washington Free Beacon, and it was fascinating. The story in the Washington Free Beacon yesterday was a giant hit piece on little Jared. This story was all about how this 36-year-old punk is trying to take over the entire National Security Council. And who the heck does he think he is? This story obviously was planted. You know, this is an intricately woven web of deceit here, and winding your way through it is a difficult thing to do. So all you can do is use intelligence guided by experience. And when it comes to the direct question, would Bannon be fired, you know, with an asterisk that I don’t really know, I’m just wild guessing, but I would say no, based on all of the information I provided up to this point. But with this crowd, anything can happen. I think that’s part of their strength, is the unpredictability and you never know what’s coming next. It keeps everybody off balance, which is I think a position Trump likes. RUSH: Let me give you some headlines here. That New York Times headline that we just delved into: “Focused on Trump’s Successes, Many Supporters Are Unfazed by His Reversals.” And the story begins with a quote of your beloved host. Washington Post: “Within Trump’s Inner Circle, a Moderate Voice Captures the President’s Ear,” we hope. And this is about Gary Cohn, the Goldman Sachs trader, liberal Democrat and his buddy and partner Dina Powell. They’re not married. She’s married to somebody else, but they are a duo in there. Goldman Sachs, they’re Democrats, they’re the globalists that Bannon keeps talking about, along with Jared Kushner and Ivanka, about whom (laughing) — do you really want to get into this? About whom it is said Jared and Ivanka want to get control of the Trump presidency because they care about what’s written about them in New York Magazine and Vogue. I am not kidding. Folks, I’m just telling you what I hear. There are people who are telling me that Ivanka and Jared actually think of themselves as the first couple because of their youth and their age and their generation and that whatever their dad does reflects on them, and they want to have influence over what their dad does so that what is reflected on them will make them cool and hip to their fellow Millennials. Up to you to decide whether there’s anything to this. But this is among the countless stories going around, such as this Washington Post story. “Within Trump’s Inner Circle, a Moderate Voice Captures the President’s Ear.” Oh, let me circle back to Ivanka and Jared. Have you heard that the reason that we sent the 59 Tomahawks into Syria is because Ivanka reportedly was brokenhearted over the pictures? Okay. If you’ve heard that, and that’s not an obscure, you know, off-the-wall piece, that’s been in mainstream pieces, then is it hard to believe that Ivanka and Jared would want to try to control as much of the presidency as possible so that it reflects well on them and what they believe? I mean, after all, if your dad were president, and you’re in there in the White House every day, do you think you just sit by, let dad do what he does? Or would you try to influence Dad? Just putting it out there to ponder. Anyway, this Washington Post piece: “As power struggles and ideological battles engulfed the White House, an unlikely player is exercising new influence on the direction of President Trump’s administration. Okay, so who leaked this? Who arranged for this story to get published? Well, I’ll guarantee you this, the Washington Post loved printing it. Anything that they could do to say that Bannon’s losing power, anything they can do to say that Trump is now normalizing and becoming more like an establishment president. They eat it up. Anything they can do to neuter Trump. I don’t know that I said that specifically, but I did acknowledge the effort to bring that about is certainly happening. RUSH: You know, there’s so many of these stories, Gary Cohn, and obviously Bannon. You’d be forgiven if you forgot that Donald Trump was president now and then. RUSH. You know, I was talking about conventional wisdom. I forgot to share with you what the conventional wisdom is right now, the bottom line conventional wisdom. And you’ll find this at many conservative websites, many conservative blogs. You’ll find this at liberal blogs. You’ll find this in the Drive-By Media websites. The conventional wisdom is that Bannon is finished, whether he stays in the White House or not. That the anti-Bannon forces have won. That in less than a hundred days, Donald Trump has been converted from a populist and nationalist to an establishment moderate. The transformation didn’t take long, and it has to be a devastating loss for Bannon. Rich Lowry has written that, for example. Now, a caveat. Lowry said I don’t know how this is gonna end, so he’s not suggesting we’re there yet, but then he lays out the scenario I just shared with you as where it looks like this has happened, and much of the Beltway conventional wisdom is the same thing, that in under a hundred days the establishment moderate forces have already taken control of Trump and the things he stood for during the campaign are shortly and surely going to disappear. Now, I don’t know how that squares with Jeff Sessions going down and telling people you’re not welcome, our border is not open, our border is closed. And the way Trump’s dealing with North Korea and Syria, I don’t know. But I’m just telling you, that’s what it is. Now, that’s to end it. Politco: If Trump Fired Bannon, Would He Seek Revenge?